Good selection of flavours including an amazing cioccolatto, pistachio and raspberry. 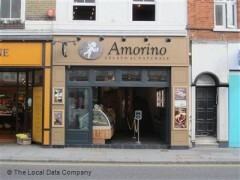 Friendly efficient service with an authentic Italian feel. Will come back here again the next time I'm in the area. Sadly the service and the staff did not live up to the expectations of the lovely ice cream parlour set up in the heart of kings road. The gentleman taking our order really didn't want to be working especially on a Sunday! No smile and not a sign of happy welcoming service. Once we ordered soon after the crepes and milkshake arrived. Super quick service! The reason: the milkshake was not filled to the top and the crepes was COLD when we asked the waiter to re do it as it was cold we received a terrible arrogant attitude and told us this is how it's done.